In an upcoming podcast episode, you'll find out that Russ and I have taken opposing positions on two of TJ's newest and most-talked-about, most-posted/pinned/tweeted/instagrammed products: this pickle popcorn and the Key Lime Tea Cookies. I was originally going to review the tea cookies first since I tried them first, but now that we've talked about it a little and I know where each of us stands, I think it would be better if I started off this new batch of products with a positive review. Negative reviews have their place and are sometimes necessary, but there's plenty of negativity in the world currently, don't you think? So let's be positive for a minute...and maybe just a bit silly. Ahem. This product is the answer to that age-old question: "What the dilly, yo?" Yes. This stuff. This popcorn is the dilly, and it is indeed very dilly. It's cooked in dill oil, and although that's the last ingredient on the list, you can sure taste it. I personally don't think they overdid it with the dill flavor. Any less and you might not know they were going for pickle popcorn. But as it is, it's unmistakably flavored like a dill pickle. It's that salty, vinegary, dilly flavor you've come to know and love as a pickle—yet it's popcorn. 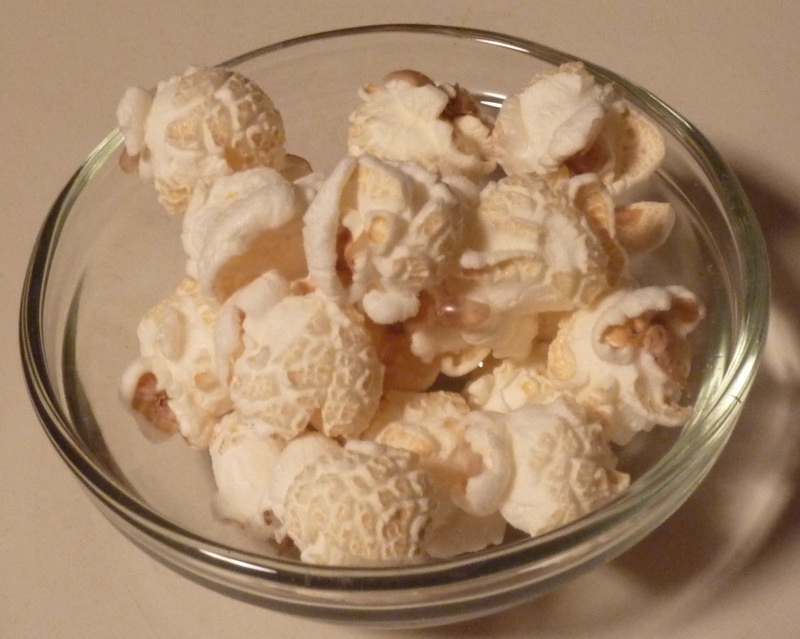 Unlike a popcorn we looked at long ago, you can't see any of the spices or flavors on the exterior of this popcorn. Looks-wise, they appear to be normal, average, everyday, unassuming, non-pickle type corn kernels. Looks can be deceiving. 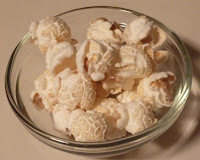 Texture-wise, it's similar to what we've seen before from TJ's flavored popcorns: nice fluffy, white, fully-popped corn kernels with a nice crunch and firmness, with very few "widows" or unpopped kernels. If you like the smell of a dill pickle, but could never get into the whole cucumber-soaked-in-vinegar type mouthfeel, you might want to give this product a whirl. It's like eating a dill pickle taste-wise, but with a brand new texture. I must admit that I can't completely binge on it. A handful or two can be very satisfying, but more than that and it feels like I'm overdoing it. It's almost like the dill oil builds up in my system and doesn't leave it very quickly. Maybe Sonia's body processes the dill faster than mine, but she's entirely happy to binge away. 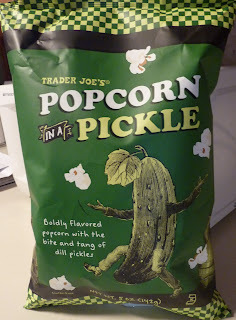 Overall, though, I think it's a very unique popcorn flavor executed quite nicely. I give it four stars. Sonia sees my four and raises me half a star. Wonder if its as strong in flavour as canadian snacks. We like it nostril burning, puckering pickly! Did you try dill pickle wheat thins in the states last year? They were about 50% as prickly as Canadian brands. I love this stuff. I'm like you, though, in that a handful or two is all I can handle before it becomes too much. That's probably a good a way to help me cut back on snacking. As someone who's mostly had to give up pickles (vinegar=acid, more acid=stomach contents making a break for it), this stuff is great. Enough dill and vinegar flavor to taste pretty darn close to a pickle, without being overwhelming (as some salt & vinegar chips can be). Oh my gosh I can't wait to try this. I wish it were creamy dill pickle popcorn. I remember having creamy dill pickle potato chips in Canada that I became addicted to. I bought it tonight and it is fantastic Nathan. I agree you can't eat too much at one sitting, you get sort of brine out. I figure if I want to make it a creamy dill I can just sprinkle in some dehydrated powdered sour cream. Now if I only could get dill pickle ice cream... Had it at a test outlet store back in the late 1960s and it was really good. I used to get one scoop dill pickle and one scoop black licorice ice cream. Now that sounds a little scary to me!